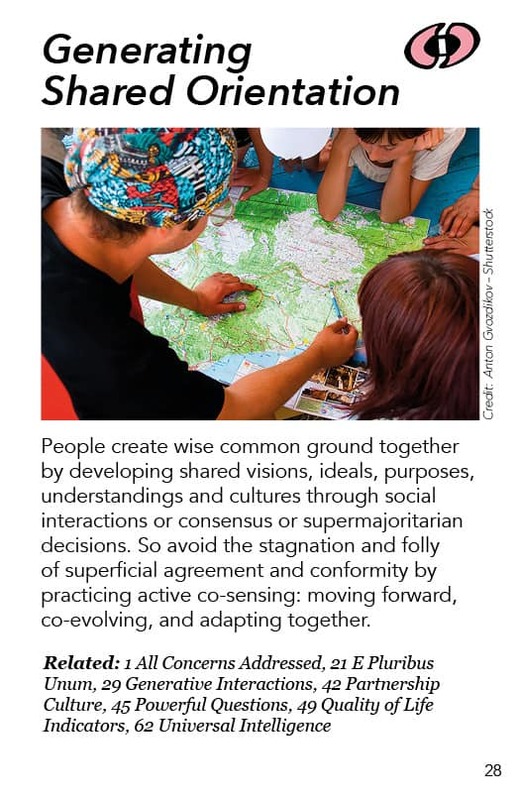 People create wise common ground together by developing shared visions, ideals, purposes, understandings and cultures through social interactions or consensus or supermajoritarian decisions. So avoid the stagnation and folly of superficial agreement and conformity by practicing active co-sensing: moving forward, co-evolving, and adapting together. There are many different ways of generating a shared orientation using visions, ideals, purposes. These are all forward-looking aspirations we strive for together. In order to do that powerfully and authentically, we need to generate them together, we need to come to them in conversation among ourselves. We’re not talking about a vision or idea or purpose that’s handed down to us from someone somewhere else. This is what we believe we should be striving for. The co-creation of such shared aspirations is a very important dimension of this. “Shared culture” is something we have together. We need to notice here that culture is not just one homogenous thing. Culture is fractal, it shows up at different levels, in different contexts. You can have a culture in a relationship or a family. You can have a culture in a company, in a community, or in a society, or when people speak the same language, or where people are in the same profession. So there’s all these different levels and realms of culture and it’s nice to have a shared culture as a common ground to work with. It is also good to realize that we are always co-creating our shared culture together. To a certain extent culture is a given, but to a certain extent it’s something that we co-create constantly, particularly in times of major transformation. There is a book called The Cultural Creatives about a part of society that is not tied to tradition or to the economic scientific worldview – a subculture that is realizing “we are in a major shift and we have to find new ways to do things.” Many different people are participating in this effort to create new cultures. So that’s generating a multifaceted shared orientation that is emerging all over the place. Very often (in the United States anyway) pundits will talk about how there’s a consensus about such and such. That “consensus” is usually around 60% at most, which is a very small super-majority. When we are striving for a shared orientation or a general agreement in decision-making – say, with thousands of people – the chances are small that we’ll get anywhere near 100%. If we get 80% of 2000 diverse people, that’s a truly remarkable level of agreement, a pretty amazing shared orientation. But we are developing group methods that make that kind of shared orientation increasingly possible. This particular pattern is looking at all the different ways we try to generate shared orientation and to what extent we can succeed in doing that. We are actively looking for an orientation we all feel good about. We value co-creating common ground together, and that’s an ongoing multidimensional process in all the different realms and scales our group, community or society occupies. The wisdom that we are generating together is the sense that we have common ground, that we are standing in the same territory looking in the same direction, striving to achieve certain things together with all our diversity still flourishing. If we are all talking a different language, if we all have different purposes, if everything is different, it’s really hard to move ahead together. True, there are people who speak totally different languages who nevertheless achieve remarkable understanding because their level of interpersonal empathy is so high. So there are different ways to pursue this, but all those different ways are searching for some common space to occupy together and some sense that we are moving in a direction we all feel good about. We don’t want to just agree, however. Mere agreement usually involves a lot of compromise, a lot of force, a lot of social conformity and peer pressure. So we don’t want that. We don’t want a scene where we all agreed on X in the meeting with the expectation that nobody would dare raise their hands to dissent. That’s the kind of thing we are trying to avoid. Because it’s not really shared orientation when we have used force of argument, force of tanks, force of whatever, to ensure that people do or say what we want. We’re trying to create a culture and institutions that help us sense into where are we now and where are we going and adjusting together. We’re all kind of feeling our way, adapting to circumstances. We share an understanding of what’s happening, we share an understanding of how each other thinks and feels about it. We share a desire to move forward together well and what that looks like is constantly shifting. I live in a cooperative house where that’s the spirit of what we’re trying to do. The phrase “co-sensing” reflects that spirit – a phrase that came out of a conversation with Jim Rough, the founder of Dynamic Facilitation. I’ve been exploring this in our house of 8-12 people for more than a decade: What does it feel like to feel our way together? How do we go about doing that? Scenario work explores different possibilities: we look at this factor and that factor and how they interact. Let’s imagine it plays out in this way or that way in the future. We’re trying to sense into that together and feel what it feels like, feel what kinds of agreement and disturbance come up among us when we look at this possibility or that possibility. Visioning is the generation of a shared vision. There are a lot of exercises that have been done where many people in the community come together, or stakeholders come together and ask, “What would we all like to see happen?” There are different processes to help people do that but the ultimate aim is finding something we all really would love to have happen, and clarifying what our various roles will be while we make it happen. So that’s the shared orientation. Consensus Process: The most elegant way I know of doing consensus process is continually exploring who else has information about this? Who else has ideas about what’s important to attend to here? What different perspectives do people have? We’re exploring all that together and as something begins to surface that looks like maybe this makes sense to all of us, we’re going to ask: “Does anybody have any concerns?” We actually want to know if anybody has concerns. We’re not like, “If you have a concern, just shut up, since all the rest of us are on board with this!” If people don’t speak up, then that is not really consensus process. If they still have concerns we actually don’t have shared orientation. So that’s a way of generating a shared orientation, when everybody feels that their needs and interests and ideas are taken into account. Dynamic Facilitation is a master of process for this kind of thing. Once participants feel really well heard they come together into a lively conversation that generates shared breakthroughs. 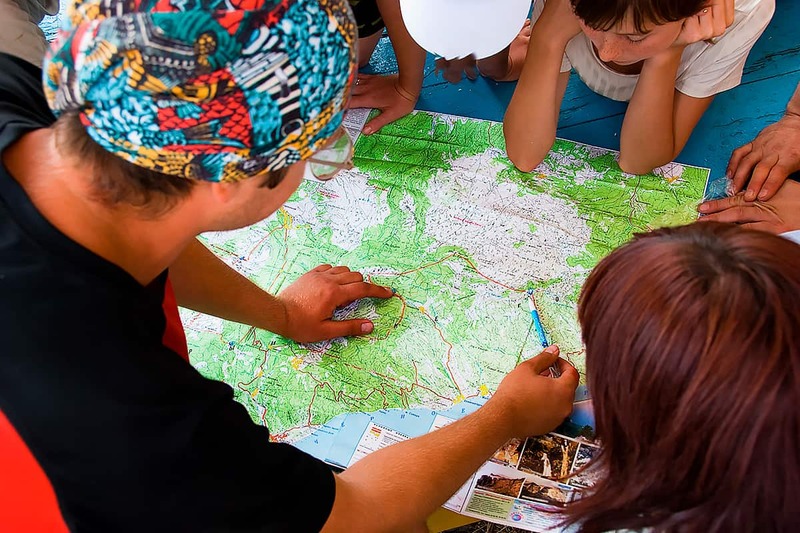 And of course having a good group purpose or organizational purpose is very important, particularly when the purpose is generated by the people in the group or organization. The alignment can be very powerful. This is one of the fundamentals of self-managed “teal” organizations.